Meadow Lake Airport Falcon Colorado has the uniquely imperative identifier KFLY. 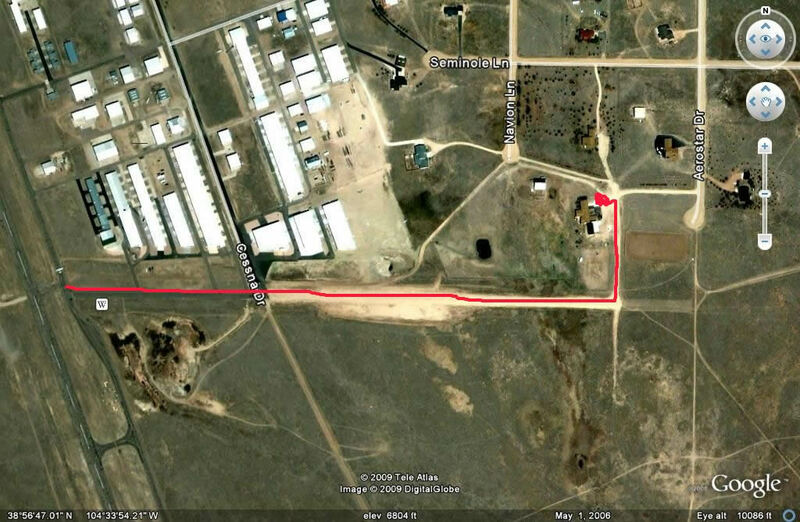 This photo shows the GPS track of a small plane traveling from the taxiway to a house in the airpark adjacent to the airport. This was the first location of the KFLY weather webcams quite a few years ago. The installation site was less than ideal. The only available mounting location was an ordinary television antenna mast. Falcon is on the north side of Colorado Springs and often sees strong winds. Consequently, the cameras shook badly in even moderate winds. During one particularly bad storm the entire mast fell over when one of the old guy wires broke. Also during that storm a nearby lightning strike destroyed one camera and a port on the network switch inside. It was not a direct strike. Any lightning within half a mile can induce a large surge inside electrical cables. That fact alone is the best reason to add surge protection at the camera and inside where the camera cable connects to the networking equipment. I learned that lesson well and now I recommend protective arrestors on all installations that have frequent thunderstorms. The devices shunt high voltage and current surges to ground on all signal lines of a network cable. During surges, these devices sacrifice the shunting components inside and protect the cameras and network. They cost much less than the rest of the system and they work.